For a presentation May 8 to the Washington Alaska Chapter of the Healthcare Financial Management Association, I added to my talk a few comments on income inequality. It is not hard to find ways of illustrating growing income inequality in the United States and elsewhere. Here a few slides prepared for my talk. The first two show the fractions of personal income from wages and salaries (declining) and from transfer payments (rising). The third slide combines the first two. Optimists will note that the decline in wages seems to have flattened out and that there has been a modest relative decline in transfer payments. Pessimists will point to the trend line in wages and the fact transfer payments remain dramatically higher than before the Great Recession. The fourth slide (right side of the middle row) compares wages and salaries and corporate profits as a per cent of GDP. As the chart notes, both are at or near record levels. 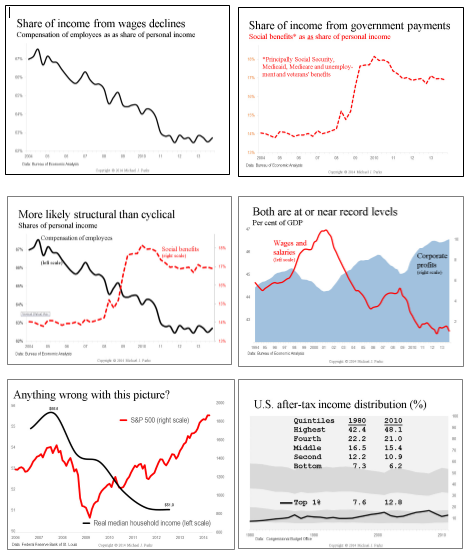 The fifth slide (left side, bottom row) charts real median household income (data available only through 2010) against the Standard and Poor’s 500 index. The final chart, right side of the bottom row, illustrates after tax personal income by quintiles (the area graph, adding up to 100%) and the share of national income garnered by the Top 1%. Note that the share of income over the roughly 32 years of chart data has declined for all but those in the top quintile, and that the One Percenters in that time have nearly doubled in share, from in 1980 to 12.8% in 2010. One important caveat: The income data do not include transfer payments, which significantly increase the total income of many households, including those at the bottom of the income ladder. Transfer payments include Social Security, Medicare and Medicaid benefits, unemployment insurance, disability payments and the like. That doesn’t change the the fact that the gap between the Top One Per Cent and the rest of us continues to widen. There is no question in my mind that income inequality will be a top political issue for as far ahead as the eye can see. On my reading list currently are Angus Deaton’s The Great Escape and Hedrick Smith’s Who Stole the American Dream. And on the recommendation of a friend, I’ve just started dipping into Charlie LeDuff’s Detroit: An American Autopsy.